Dubai: A defiant Libyan leader Muammar Gaddafi on Tuesday refused to step down as violence escalated in the Libyan capital Tripoli and bodies littered the streets. 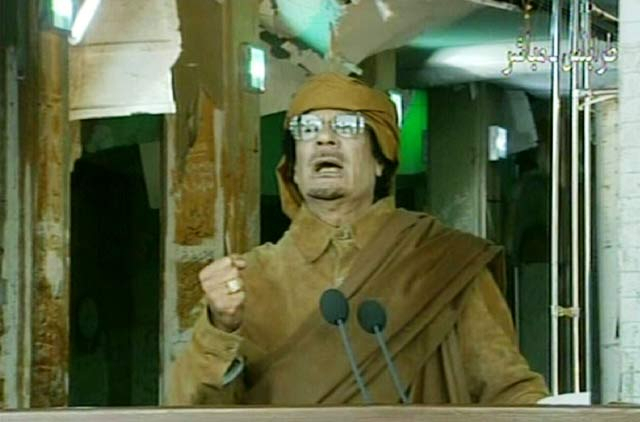 In a fiery but rambling address on state TV apparently made from a building bombed by US warplanes in 1986, Gaddafi threatened to "cleanse Libya house by house" unless protesters on the streets surrendered. He blamed the unrest on the youth and termed protesters "rats and mercenaries" who want to turn Libya into an Islamic state. 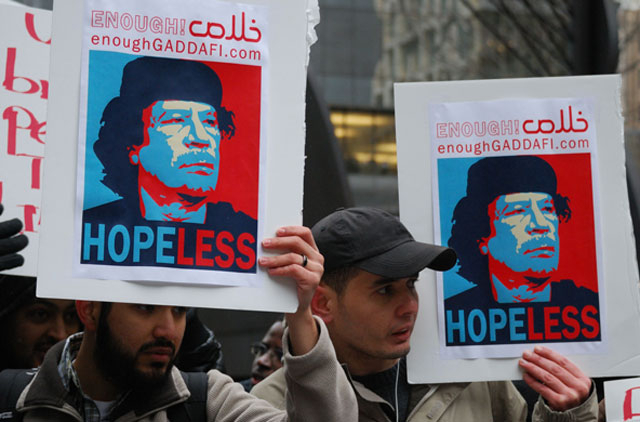 Gaddafi said that protesters deserve the death sentence under Libyan law. He called on supporters to take control of the streets today, adding that Libyans could have whatever constitution or legal system they wanted. "I am not going to leave this land, I will die here as a martyr," he said. 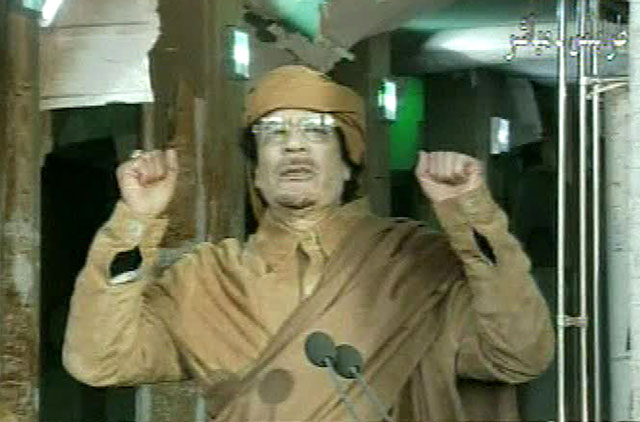 "Gaddafi does not have a post to resign from, Gaddafi is the leader of the revolution," he said. "This is my country, I will not leave the land of Libya." Gaddafi's speech came as more deaths were reported in Al Bayda. A resident Marai Al Mahry told Reuters that 26 people, including his brother, had been shot dead. "They shoot you just for walking on the street," he said. However, despite the attacks against demonstrators, east Libya reportedly broke free. "All the eastern regions are out of Gaddafi's control now ... The people and the army are hand-in-hand here," former army major Hany Sa'ad Marjaa, said. Human Rights Watch said at least 233 people have been killed, but opposition groups put the figure much higher. Meanwhile, for the first time since the regional unrest, the Arab League was to hold an emergency meeting in Cairo. The UN Security Council also held closed-door discussions with western envoys and Libya's own breakaway delegation. Ali Aujali, Libya's ambassador to the US, told ABC's Good Morning America that he no longer represents his country's government and called on Gaddafi to step aside to avoid further bloodshed. "Please, please, help the Libyan people. Help them. They are burning," he said. "We need the world to stand by us." Navi Pillay, UN High Commissioner for Human Rights, called for an investigation, saying widespread and systematic attacks against the civilian population "may amount to crimes against humanity." More than 1,000 people have been killed and at least 5,000 injured in Libya since February 17, according to Al Hadi Shallouf, Chief of Justice and Democracy for Libya (JADL) party and member of the International Criminal Court in Hague. Shallouf, who is currently in exile in Paris, told Gulf News the final figure of the number of people killed by the mercenary fighters of Gaddafi is still not clear. "Lawyers and medical sources from inside Libya are working together to prepare a file documenting war crimes to be presented to the UN Security Council and the International Criminal Court soon,” he said. "A professional committee has been formed and started working to investigate the situation on the ground, especially in the eastern part of the country where revolutionists gained control and expelled the forces of the regime,” he said. Shallouf said: we are keen to finalize the report before the total collapse of the regime in Tripoli because we are not in a position to forgive Gaddafi for the blood he spelled just to stay in power. He said Gaddafi and his seven sons and daughters in addition to his top aids will be prosecuted for crimes against humanity and expected the UN Security Council to issue a resolution under the 7th chapter which allows the member states to intervene by using force to implement the international resolution. Libyan security has cracked down on anti-government protesters and fighting has spread to the capital Tripoli after erupting in Libya's oil-producing east last week with no signs of Leader Muammar Gaddafi stepping down after 41 years in power. Egypt's foreign minister told his nationals in Libya to, if possible, remain in their houses and secure themselves with enough food and water and to stay off the streets. About 2,000 army officers and soldiers have handed over their military uniform to the chief justice at the North Benghazi Court House in the second largest city in the east of the country on Tuesday a week after the city revolted against Gaddafi authority. The city lost 275 lives and more than 2,000 were injured in five days of confrontation between what revolutionists said African mercenaries and peaceful protesters. In a telephone interview, Bennor said the security is being looked after by youth who formed local committees. He said Bnena International Airport has been closed by the revolutionists to stop the use of its runways by the mercenaries of Gaddafi. Judge Bennor said the ad-hoc management council has called for fuel supplies from Tobruk refineries and tanks have been rushed to the city to bridge the shortage of fuel. He said the city has enough food for the coming three months and medical supplies were received from Egypt in the past three days, but hospitals in the city still face shortage of blood units and medicines. The Arab League will hold an emergency meeting in Cairo for delegates on Tuesday to discuss the Libyan revolt against Muammar Gaddafi, the league said. The ambassadorial level meeting will take place at 5 pm Cairo time. Libyan security forces have cracked down fiercely on anti-government demonstrators, with fighting now spreading to the capital Tripoli after erupting in Libya's oil-producing east last week. Egypt will reinforce its border with Libya with "border guards" and will open the crossing at the northwestern town of Saloum for "sick and injured," the country's ruling Supreme Council of the Armed Forces has announced according to Reuters. Al Jazeera has reported from Cairo that as of midnight, around 4,000 Egyptians had returned from Libya through Saloum, in the northwest corner of Egypt. The International Coalition Against War Criminals, has reported 519 dead, 3,980 wounded and at least 1,500 missing in Libya since the start of demonstrations last week. Five major cities in the eastern part of Libya have been liberated in the 8th-day of the uprising according to sources from revolutionists. Salim Al Okali, journalist from the city of Derna said the city - 300 km to the east of Benghazi and 1300 km east to Tripoli — has been enjoying life without Gaddafi for the first time after 43 years. He said the road between Benghazi and Emsaed Border Crossing with Egypt. is managed by revolutionists and policemen working under the civil authorities in the cities on the road. “Emsaed's land port is managed also by a group revolutionists. The group is operating the port around the clock to facilitate the departure of foreigners and Egyptian workers to Al Salloum Land Port of Egypt,” he said. Al Okali said Benghazi, Al Marj, Shahhat, Al Bayda and Derna were all under civilian management formed by the revolutionists in the five liberated cities. He said Tubruq, the city of oil and gas refineries, is helping other cities by ensuring fuel supplies of each of the liberated cities are sent on time. The civil authority in Tubruq which is major oil export port on the Mediterranean Sea, has suspended the export of oil but works in the refinery has not been interrupted. “The cooperation and cooperation between all liberated cities is getting better and people are experiencing the unity for the first time in the past 40 years," Al Okali said. He said revolutionists and tribesmen supporting the uprising against Gaddafi are controlling 90 per cent of the land of the country and Gaddafi has less than 5 per cent which comprises small section in Tripoli. Libyan leader Muammar Gaddafi signalled his defiance in the face of a mounting revolt against his 41-year rule on Tuesday, making a brief appearance on state television and denying he had fled the country. Cracks were beginning to appear among Gaddafi's supporters, with a group of army officers calling on soldiers to "join the people" and two senior fighter pilots defecting to nearby Malta. The UN Security Council will hold a closed-door meeting on Tuesday to discuss the crisis, diplomats said. In his first appearance on television since the revolt broke out, Gaddafi was shown holding an umbrella in a 22-second statement. He denied reports that he had fled to Venezuela, ruled by his friend President Hugo Chavez. "I want to show that I'm in Tripoli and not in Venezuela. Do not believe the channels belonging to stray dogs," said Gaddafi, leaning out of a van in front of his house. "I wanted to say something to the youths at Green Square (in Tripoli) and stay up late with them but it started raining. 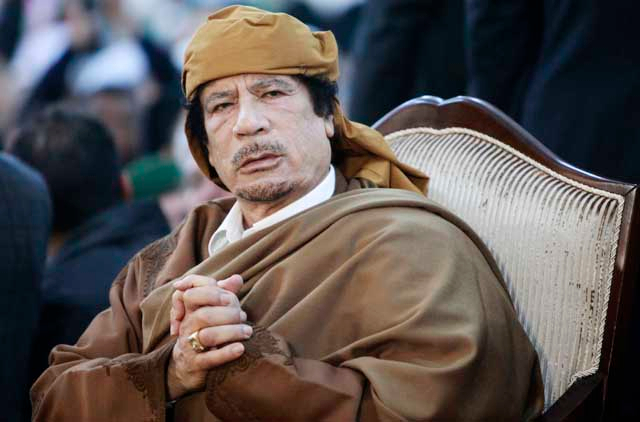 Thank God, it's a good thing," added Gaddafi, who took power in a military coup in 1969 when he toppled King Idriss. Security forces have killed dozens of protesters across the vast, thinly populated nation stretching from the Mediterranean deep into the Sahara desert, human rights groups and witnesses said, prompting widespread condemnation from world leaders. Demonstrations spread to Tripoli after several cities in the east - including Benghazi where the protests had first erupted - appeared to fall to the opposition, according to residents. Gaddafi's forces have cracked down fiercely on anti-government demonstrators, with fighting now spreading to the capital Tripoli after erupting in Libya's oil-producing east last week.